The special issue is on Naturally Acquired Immunity to Malaria. See this blog from the editors Alyssa Barry and Diana Hansen. More than 100 years ago, the German microbiologist, Robert Koch, demonstrated that individuals living in endemic areas naturally acquire immunity to symptomatic malaria. Koch based his observations on detectable parasitaemia in children, adults and transmigrants in Papua New Guinea and Indonesia, as well as highly endemic areas in which people were exposed to hundreds of infectious bites each year. By observing higher rates of parasitaemia in exposed children and transmigrants than in exposed adults he concluded that immunity develops slowly after many years of exposure but that sterile protection is never achieved. This clinical immunity (i.e. immunity against the symptoms of malaria) was described as a reduction in parasite density and prevalence of disease with age. The variable nature of malaria epidemiology in different endemic areas underlines the importance of natural exposure in development of immunity: from unstable transmission where immunity is not achieved, characterised by frequent clinical infections in all age groups, to endemic areas where the peak of infection prevalence occurs in increasingly older age groups as transmission declines. Image credit Drew Berry, (WEHI. 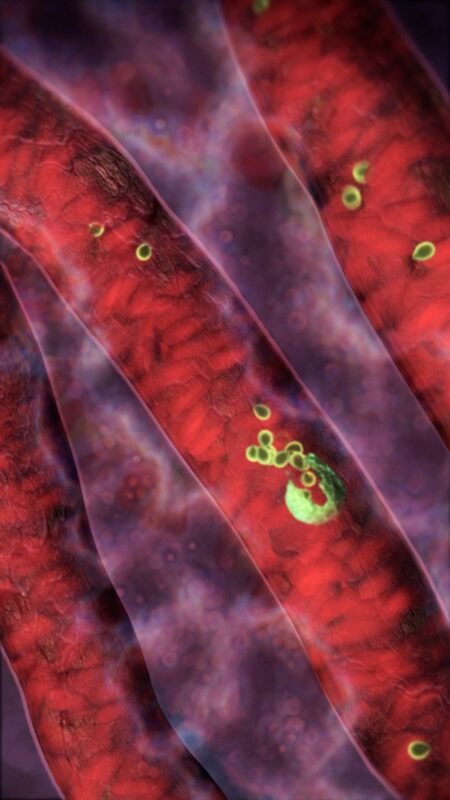 TV, 2008) “Plasmodium merozoites emerging out of a ruptured red blood cell and circulating in the microvasculature”. A lack of understanding of the mechanisms by which natural immunity to malaria is achieved and how it is maintained has long been proclaimed as a major hurdle to development of a malaria vaccine. In the 1950s, seminal experiments by MacGregor and Cohen confirmed that antibodies were a key component of antimalarial immunity. In the 1960s and 70s, the first irradiated sporozoite (whole parasite) vaccine trials were conducted leading to the identification of key malaria antigens such as circumsporozoite protein (CSP) now the basis of the most developed vaccine candidate RTS,S. In the last half century, with the identification of many additional antigens, animal model and clinical vaccine trials of so-called “subunit vaccine” approaches have shown varying success. While these early studies were painstakingly slow and revealed limited information, more recently, immune targets and potential vaccine candidates have been characterised at the molecular level, and large well-designed epidemiological studies have identified antigen-specific immune responses associated with protection against malaria infection and disease. The field is now armed with a growing knowledge base, which raises hopes for new approaches to development of a broadly effective malaria vaccine. In this Special Issue of Parasitology we present nine reviews from leading experts in host responses to malaria infections. The reviews outline current knowledge and perspectives on many critical aspects of immunity and more recent insights, such as immunity to the lesser-studied Plasmodium vivax and the impact of declining transmission on natural immunity. Many of the reviews provide perspectives on how this knowledge is contributing to vaccine design, and one review in particular focuses on how we can capitalise on the ‘omics’ era to develop novel approaches to malaria vaccines. By no means exhaustive, the reviewed topics highlight the complexity of immunity to malaria and that even after 100 years we still have much to learn. Read the special issue for free until 1st August 2016.